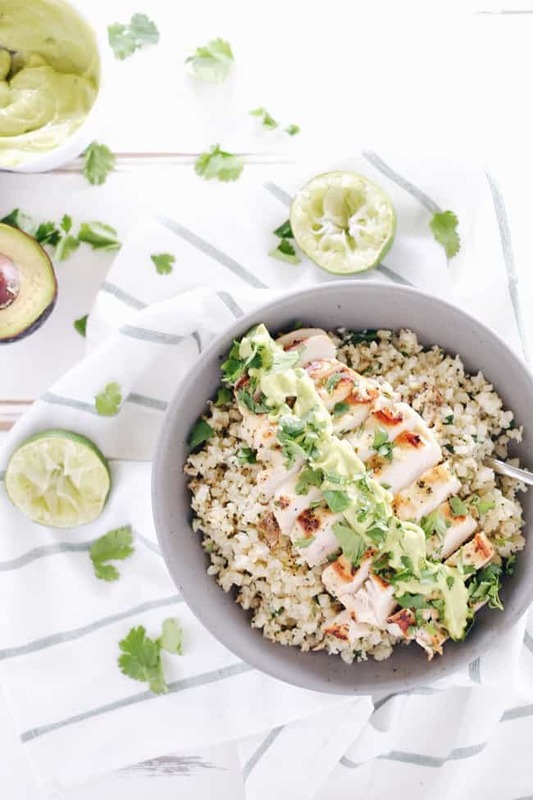 Don’t you just want to eat everything in a bowl, like this cilantro lime chicken bowl?! I do. It’s funny because when Justin and I first started dating I remember we were exchanging food photos over text…yes, this food obsession has been from the very beginning! Anyway, we were exchanging photos of eggs we made for dinner one night. You know, before we lived together and cooked our dinners together every night. Maybe it was our way of flirting…food does speak right to my heart! Justin’s eggs were on a plate, and mine were in a bowl. I thought it was so strange that he’d eat his eggs on a plate. Do you eat your eggs on a plate, or in a bowl? Just curious. These days, I notice many of our meals are eaten in a bowl, like sometimes it feels like we need to run the dishwasher just to have clean bowls. I don’t even know the last time Justin had eggs on plate…actually I do. It was on a weekend recently when I made pancakes, bacon, and scrambled eggs. We ate the pancakes on a plate (duh! eating pancakes in a bowl would be silly!). So, the eggs went on the plate as well. That seems totally logical though. Ha! I’m sure he loves how my quirks have worn off on him! 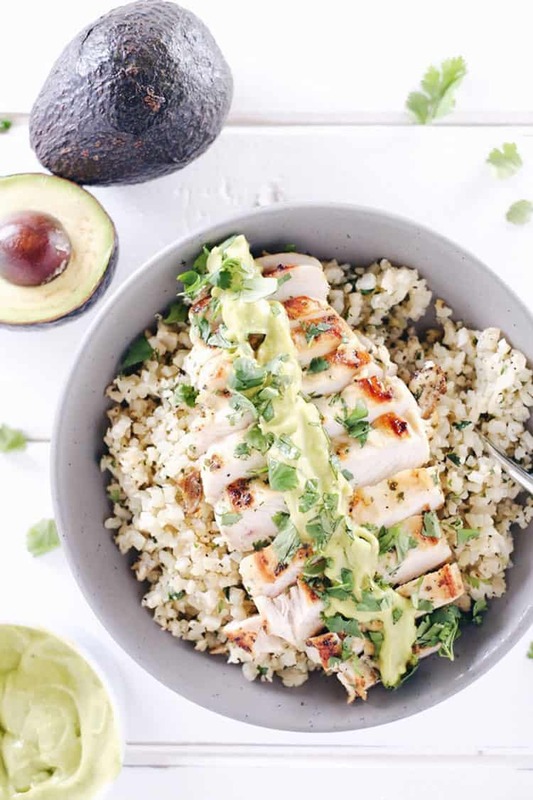 Moving along to what this post is actually about…our cilantro lime chicken bowl! Hooray! It is like a little citrus fiesta, all wrapped up in a complete bowl meal. I think that is why I love bowls so much…you can get all the nutrients you need and want all in one package, bundled up in a tasty little bowl. Plus, it looks pretty cool, too! A version of this recipe was originally created for our upcoming e-cookbook 30-Minute Paleo Meals! It will be a collection of our favorite recipes, all made in 30 minutes or less AND even better, with seven or less ingredients (not including oils, salt, and pepper of course). We can’t wait to share more with you! 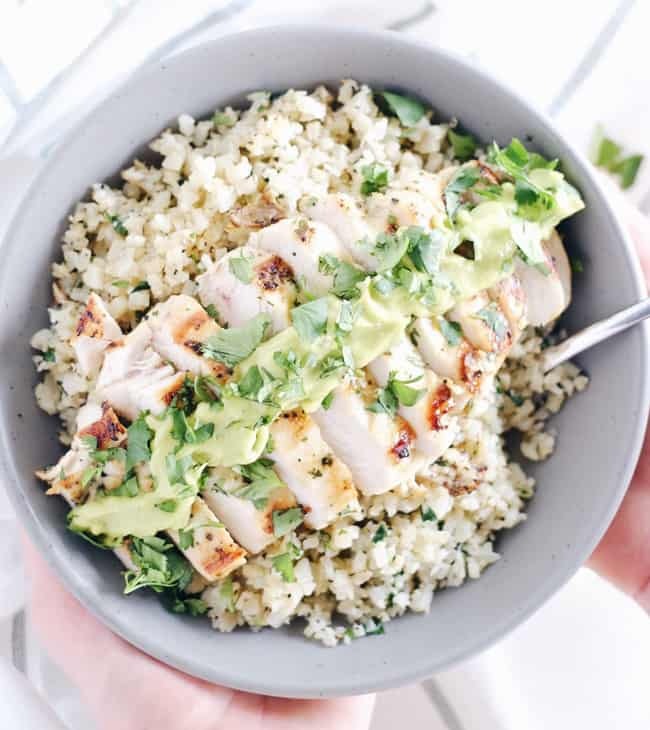 We decided this cilantro lime chicken bowl was better suited for the blog, and we are actually happy we get to share it sooner than the release of our cookbook! Have you ever made an avocado cream before?! Just looks at how it catches the light, and then imagine the dairy-free creamy goodness it adds to your bowl. There are just so many layers and flavors, all wrapped up in this bowl. If eating every meal in a bowl is wrong, I don’t even want to be right. 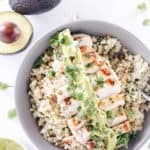 Give this cilantro lime chicken bowl at try, and let us know how it goes by leaving a comment below. Also, snap a photo and tag us on Instagram @realsimplegood so we can check it out! First make the marinade for your chicken. In a large ziplock, combine your avocado or olive oil, lime zest and juice, chopped cilantro, salt, and pepper. Then, place your chicken breasts between two sheets of parchment paper or plastic wrap and use a meat mallet or rolling pin to flatten your chicken so that the pieces are even in thickness. Then, add your chicken to the ziplock with the marinade and mix everything around so the chicken is fully coated. Place in the fridge to marinate for at least 15 minutes. I let ours marinate for about an hour and it was great! While the chicken is marinating, make your avocado cream. Place all of the avocado cream ingredients in a blender or food processor and blend until smooth and creamy. Start with one tablespoon of water. You may need to add more water to get the consistency thinner depending on the size of avocado used. It should be like a thick and creamy salad dressing. Also while the chicken is marinating, if you are making cauliflower rice from a head of fresh cauliflower, use your food processor to rice the cauliflower. Then, place your riced cauliflower in a large skillet on the stove. Add your chopped cilantro, and season with your avocado or olive oil, salt and pepper. Once the chicken is done marinating, cook it on the grill outside or in a cast iron skillet on the stove. Either way, use medium-high heat and grease the grill our your grill pan with more avocado or olive oil. Place your chicken on the grill or in the pan and cook for about 6 minutes on each side, or until the chicken is cooked all the way through. While the chicken is going, cook your cauliflower rice. It will only take about 5 minutes, so you can wait till you flip the chicken to start. Cook your cauliflower rice over medium heat, stirring occasionally. You can also cover your pan to speed up the cooking time as needed. Once your chicken is done, turn off the stove and serve your dinner...in a bowl! Start by creating a bed of cauliflower rice, then add your chicken on top, drizzle the avocado cream, and top with fresh cilantro. That avocado cream!! This dish is beautiful. This looks so good! LOVE all of the cilantro + lime. Those are two of my favorites. Yes! Us too! We use cilantro quite a bit! “Eating from a bowl is just better” – true story! This all sounds amazing, especially the avocado cream! Glad you agree!! We love eating from a bowl!! The avocado cream is super tasty too!! Thanks for visiting! oh my gosh! the avocado cream sauce sounds so delish!! And with cilantro chicken? I am hungry!! It appears that the cilantro chicken recipe is only fully visible on Pinterest if one signs your email list. Very frustrating. Lisa – We are sorry you had issues accessing the recipe on Pinterest. You shouldn’t have to sign up for our list to get full access to any of the recipes on the site. Since you made it to our site hopefully you were able to view the full recipe. This was DELICIOUS! I made it with chicken legs instead of chicken breast and my Fiance’ LOVED IT! Do you have the nutrition facts for this recipe? This was a delicious dinner, my 17 and 12 year old loved it! Thank you! This was amazing! Definitely adding this to my list of easy go to Paleo meals! My boyfriend loved it too! You’re welcome! So happy you and your boyfriend enjoyed the recipe :). What is the nutritional value on this? Hi there – as part of our Paleo lifestyle we actually don’t track nutritional value. It’s one of our favorite things about the way eat and live…no counting. We just focus on eating real food. You might see some posts with select macro info, and we only post those on recipes specified for the Keto (low carb) lifestyle. You could however use an online calculator or something like My Fitness Pal if you need the info. We hope you try our recipe out!